Annual Dues Reminder: Invoices for annual MSFA dues are sent to every member company in late Fall. Dues for member departments are $200 and associate members $50. 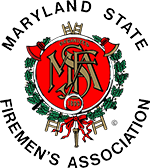 All checks should be made payable to the Maryland State Firemen’s Association and mailed to the Office of the Financial Secretary, P.O. Box 401, Jarrettsville, MD 21084. Dues are due April 1 of the following calendar year. The following form should be completed by the Company President or Secretary by May 30th in order to be eligible to vote at the Convention. Please direct any dues or department credentials questions to MSFA. Additionally, department credentials questions can be directed to Doyle Cox, MSFA Secretary at 443-532-1416.